Pretreat or produce high purity water for industrial and commercial processes. Reverse osmosis systems can be used for boiler pretreatment, drinking water applications, food and beverage service, ice production/drinking water, humidification, vehicle wash and water jet cutting machines. 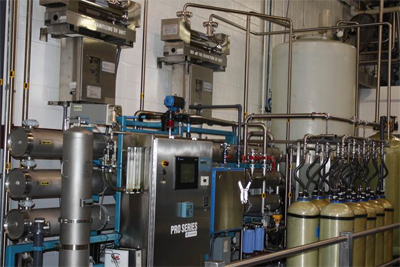 Pretreat boiler feed water to reduce scaling and energy use with reverse osmosis. Impurities in water become an important consideration when water is to be used for steam generation. With the trend toward higher-pressure boilers, pretreatment has become the key to successful operation of industrial power plants. Feedwater must be pretreated to remove impurities to control deposition, carryover and corrosion in the boiler system. Also, treated water has no minerals for scale formation and has very low dissolved gasses. Reverse osmosis food and beverage processing quality. Reverse osmosis can be used for separating constituents of foods and beverages on a molecular basis, where the foods are in solution and where a solution is separated from one less concentrated by a semi-permeable membrane. Reverse osmosis is a more economical operation for concentrating food liquids (such as fruit juices) than conventional heat-treatment processes. Research has been done on concentration of orange juice and tomato juice. Its advantages include a lower operating cost and the ability to avoid heat-treatment processes, which makes it suitable for heat-sensitive substances like the protein and enzymes found in most food products. Pretreat water for deionization systems. RO water is not as pure as ion exchanged (DI) water and is often used before the ion exchange process. When using RO water to feed deionizers or ion exchange systems, it extends their life and improves efficiency. In order to achieve high purity water, an RO is normally needed. Also, RO can remove bacteria and water-borne parasites. Improve steamer operation, ice production, drinking water quality for restaurants with reverse osmosis. Reverse osmosis can remove minerals that increase efficiency of restaurant steamers. Equipment life is extended and maintenance is reduced. Water purity can also affect dish washing efficiency, washing machine lifespan, linen/textile lifespans and more. RO systems can increase system efficiency as well as the lifespan of the water using machinery.